Married ladies, are your wedding dresses still hanging in your closets or neatly boxed up and taking up too much room in your New York apartment? Donate it to a very worthy cause! 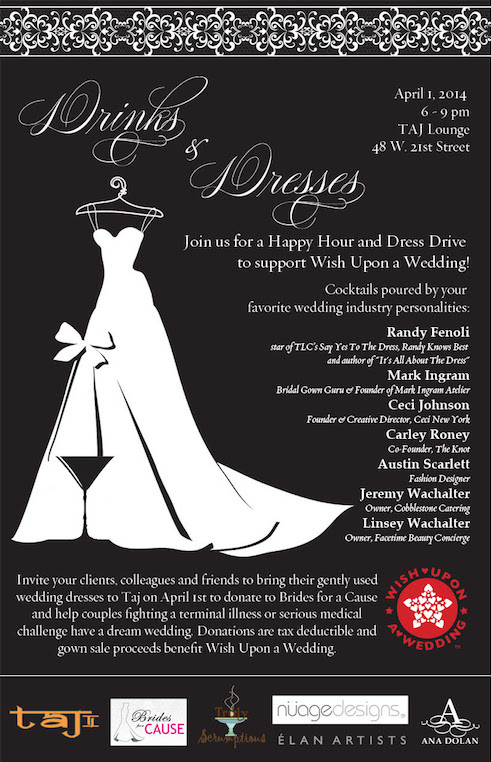 Drop by the Taj Lounge 48th W. 21st street between 6pm and 9pm on April 1st for a drink (10% of proceeds will benefit Wish Upon a Wedding) and bring along your wedding gown if you have one to donate. Gown donations are tax deductible and proceeds will benefit Wish Upon a Wedding, a non profit organization that provides weddings and vow renewals to couples facing terminal illness and serious life altering circumstances.